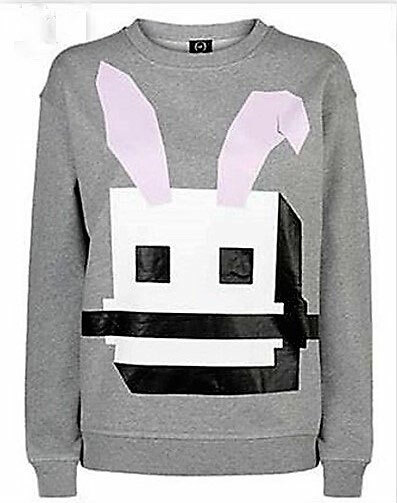 It took a while, but the Sweater has arrived in fashion. Not so long ago a Sweatshirt or a Hoodie was filed under leisurewear, not anymore. This season the Sweater gets a stylish upgrade which takes him from the sofa into the spotlight. 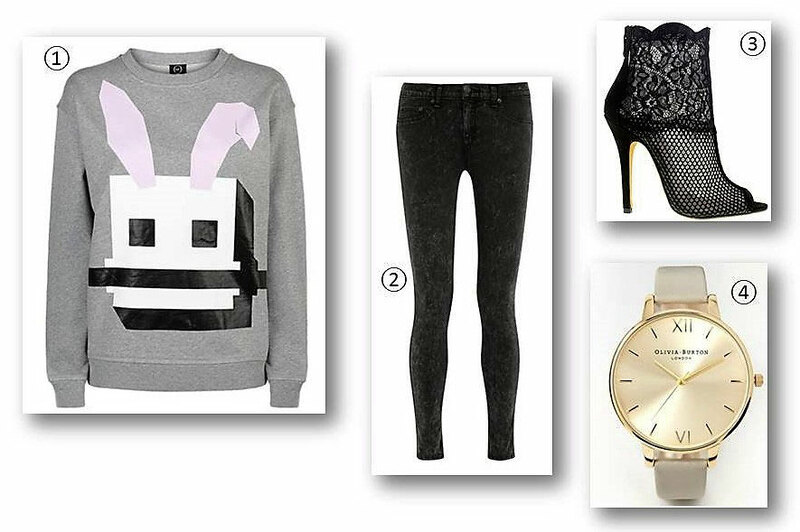 Here are three looks how I would style a Sweater this season. Girls Night is always a good opportunity to wear the latest fashion trends. That's why I combined the black Hoodie with a distressed jeans skirt and some ankle booties. The big silver earrings add some glam to the look. Yes, this season you can officially wear your Sweatshirt to work. I chose a pink Sweater with statement sleeves to pump up the chic factor for work. To keep the look feminine, I added a silver skirt. The rest of the ensemble is kept in silver, too, so that the focus remains on the Sweater and stays work appropriate. This last look is for all of you who like to take a fashion risk and combine multiple trend pieces in one look. 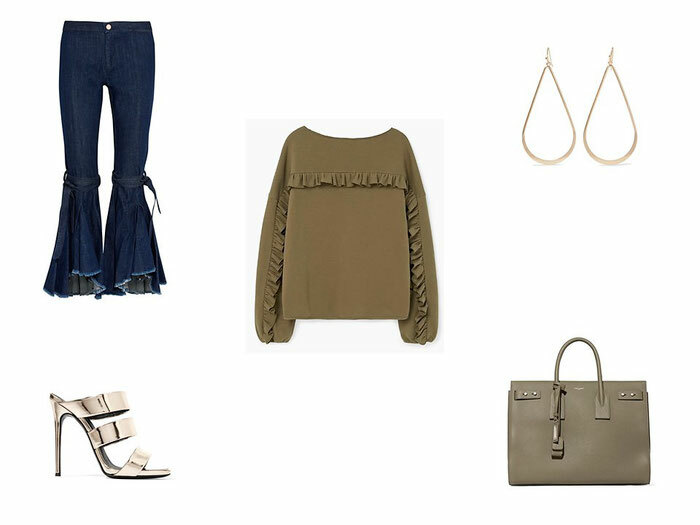 I opt for a khaki, ruffled Sweater (triple trend alert) and combined jeans with a ruffled hem (double trend alert). The golden mules, as well as earrings, take up another trend of the season to round out this look. Do you like the Sweater Trend? I know I am a little bit late to the game, but for all of you who have made plans for Valentine's Day and still don't know what to wear, I put together two completely different looks to give you some last minute inspiration for your Valentine's outfit. This look is for those of you, who opt for a more low-key location maybe even at home. Anyway, I would always skip the sweatpants and grab the boyfriend jeans instead. Then add an embellished biker jacket for a feminine touch and combine it with some cool boots. That way you kill two birds with one stone - you wear comfortable clothes and look stylish at the same time. The second look is my take on the 'classic Valentine's date night look'. The emerald green velvet bodysuit brings a subtle sexiness to the look. For the rest of the outfit, I went with black to keep the focus on the bodysuit. P.S. : I would wear a maroon lip with this look. I hope I could give you some inspiration. I hope you all had a wonderful Christmas. What are your plans for new year's eve, more relaxed, like me, or a big party? No matter what your plans are, I put together three looks to give you some ideas how to welcome the new year in style. A simple jeans and sweater look. I just stepped up the sweater game by choosing one with sequins. This is my interpretation of a stylish party look. 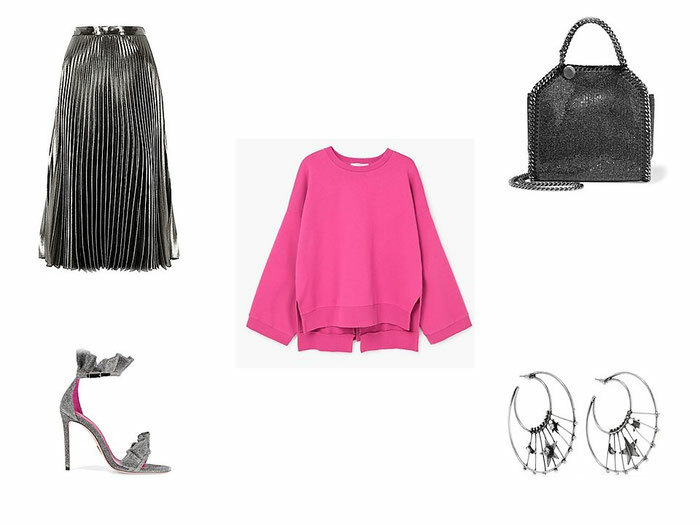 I wanted the rose metallic culottes to be the focus piece of the look, so I kept everything else in black. What a better night to make a big entrance than new year's eve? This black sequins jumpsuit will do just that. To keep it classy I combined golden minimalistic accessories. On Friday I will share with you a last minute beauty hack for your new year's eve celebrations. See you then. Can you believe that Christmas is just one week away? So time is running out to cross off everything that is left on your checklist including your holiday wardrobe. Lacking some inspiration? Don't worry I got you covered. This look is for those of you who like it comfortable but still don't want to look like coming fresh out of bed. The sweater picks up the Christmas theme in a subtle way and offers enough room to hide a foot baby. Double win! To give that outfit that certain something I combined some red glitter heels. I mean if not this time of the year, when then? Tip: You could exchange the pants for a pair of jeans to increase the level of comfort even more. The showstopper of this look is the metallic skirt. To leave it at that, I opt for black pieces for the rest of the look. This look is also a great option for a Christmas party. Tip: If you like to tone down the glam factor a bit, go for a black turtleneck. For all of you who like to keep it classy at this time of the year reach for timeless fabrics like this little black lace dress with the faux fur jacket. To further enhance the classic vibes, I dare you to go for a bold red lip like Mac's Ruby Woo (one of my all-time favourite red lipsticks). Tip: A leather jacket instead of the faux fur gives an edgy, modern twist to the classic black lace dress. That's it for my Christmas Lookbook. I also put together one for New Year's Eve, so keep an eye out for this post. Until then, have a good one. With the Easter weekend just around the corner. 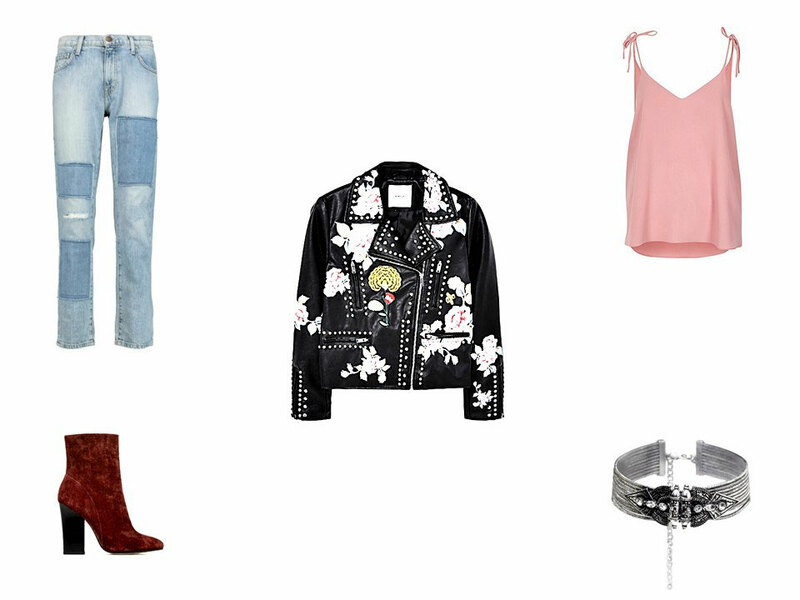 I thought I put together some outfit ideas. I love Easter Sunday because we still do an Easter egg hunt and after that, we have a long family breakfast. It's always a fun, relaxing day. Therefore, I will definitely choose a more laid back outfit, like the second outfit, below. This is a more dressed up look. 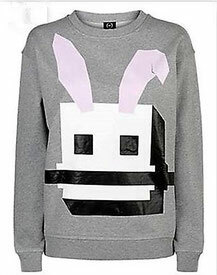 I would wear it to the Easter Mass or if I would be invited to an official Easter brunch. By itself, the black dress and the clutch create a very polished appearance; to put a modern twist on the outfit, I added the blush pink leather jacket. In comparison to the first look, this is a more literal approach to an Easter Sunday Outfit, due to the bunny sweater from Alexander McQuenn. To glam up this laid back look, I combined it with these lace ankle boots. I hope you all have a wonderful Easter weekend. What do you wear?